"As the publisher of Test Drive magazine cuts its print edition by 64 pages and moves information online, Robin Parker asks if this will work and how others adapt to the web. 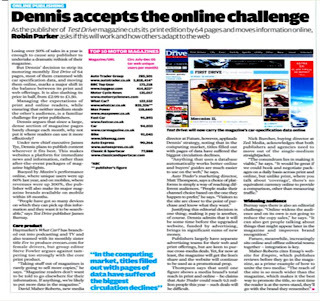 Losing over 50% of sales in a year is enough to cause any publisher to undertake a dramatic rethink of their magazine but Dennis' decision to strip its motoring monthly Test Drive of 64 pages, most of them crammed with car specification data, and moving them online, marks a major shift in the balance between its print and web offerings. It is also slashing its price in half, from £2.99 to £1.50. Managing the expectations of print and online readers, while ensuring that neither medium steals the other's audience, is a familiar challenge for print publishers. Dennis argues that since a large, dense section of magazine pages barely change each month, why not put it where readers can use it more effectively? Publishers largely have separate advertising teams for their web and print offerings, but are keen to pursue cross-media deals. Yet, for now at least, the magazine will get the lion's share and the website will continue to be used as a promotional prop. Nick Burcher, buying director at Zed Media, acknowledges that both publishers and agencies need to move out of the single-medium straightjacket. 'The conundrum lies in making it viable,' he says. 'It would be great if we could book and negotiate packages on a daily basis across print and online, but unlike print, where you talk about 'coverage', there's no equivalent currency online to provide a comparison, other than measuring traffic.' "